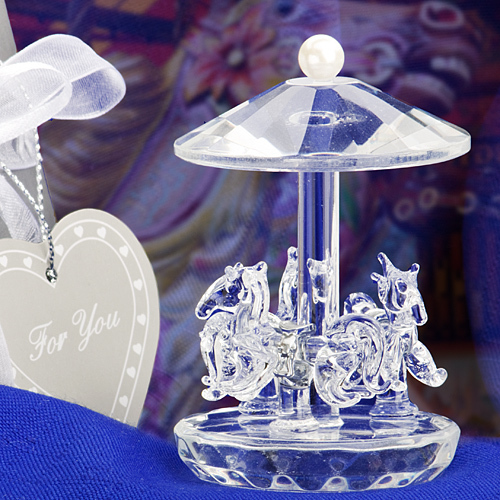 Send your guests on a merry go round ride of magical childhood memories with these exquisite carousel favors. Each exclusive Choice Crystal from Fashioncraft favor measures 2.5" x 2" with glistening multifaceted crystal glass in a classic carousel shape featuring three horses with silver metal saddles and a pearl-accented top. Perfectly amusing as elegant baby shower favors, for Christenings and more, each clear glass carousel favor makes for a stunning presentation Choice Crystal signature silver box, wrapped with a white organza and satin bow with a crystal heart accent on top and an attached silver heart shaped "Thank You" tag.